As the old saying goes, too much of anything can be a bad thing, and that includes too much exercise. Exercise, particularly resistance or strength training, builds muscle. Unless bodybuilding competition is in your plans, exercising too much can develop more muscle than you need or, inversely, weaken the muscle you have. Excess exercise can cause health problems, as well, especially if the diet is lacking in proper nutrition. Overtraining can signal the body to start burning muscle for fuel and store more fat, resulting in some weight gain. The body mass index measures the amount of fat in the body, but the numbers may be skewed by muscle mass. While building muscle to burn fat, remember that muscle is heavier than fat. The bathroom scale may show weight gain when fat is lost and muscle gained. This is not an indication of failure, but of success, as the developing muscle reshapes and tightens the entire body. If someone is working out regularly or is an athlete, a BMI may falsely indicate the presence of too much body fat. For a more accurate indicator of whether the excess weight is muscle or stubborn fat, consult a physician or other health professional to get more precise information and measurements. If the point of exercise is to lose weight but the pounds are multiplying instead, make sure you are eating the right kinds of food. Exercise burns energy, and that energy must be replenished. Try having several small meals during the day instead of three larger meals. Keep a food diary to see exactly where you might be falling off the nutrition wagon. For example, while a percentage of the daily diet should be from fats, half to two-thirds of those fats should be polyunsaturated or monounsaturated -- the so-called good fats. A nutritious plan, whether for weight-loss or health maintenance, should be heavy on vegetables, fruits and grains and light on meat. Gaining weight while exercising heavily may indicate a subconscious decision to overeat, as if the exercise makes up for the extra calories. Make sure the calories consumed are the most nutritious available and that you do not consume more than is healthy for the weight you want to reach or maintain. Over-exercising can cause changes in hormone levels, including testosterone and cortisol. Upsetting the body's hormone balance with overtraining can signal the body to burn muscle instead of fat. As a result, you may notice that lifting the usual amount of weight, running the usual distance and other stamina and strength exercises have become more difficult rather than easier. If it has become almost impossible to finish your usual workout routine, overtraining is the likely culprit. If cortisol levels rise too high and stay elevated for too long, the adrenal glands may stop working properly and as cortisol levels drop below normal, weight gain occurs. Any activity can be overdone, resulting in too much exercise for the body to handle. Workouts are designed to stress the muscles, causing small tears that the body repairs, which strengthens and builds muscle. The body needs time to adequately repair the damage wrought by exercising. 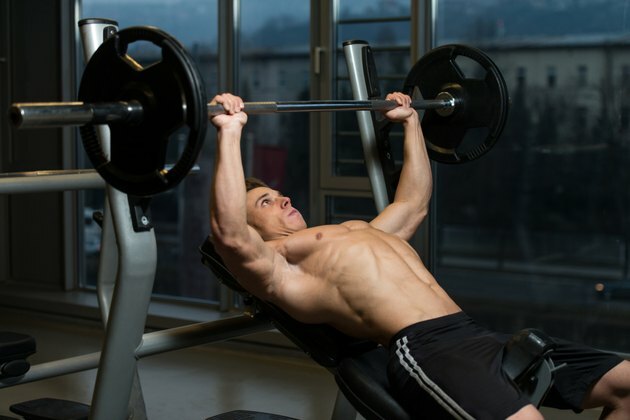 This is called periodization and should be practiced as faithfully as your workouts. Vary the workout routine and allow enough resting time for recovery to banish both the boomerang weight-gain of over training and to keep the workout from becoming boring for you and your muscles. Carbohydrate replacement beverages cause a temporary weight gain, according to a study by the Gatorade Institute published in the "Journal of Applied Physiology" in 2010. If using an electrolyte beverage to rehydrate after a workout, wait about four hours before getting on the scales. If weight-gain despite a more intense or longer workout occurs, something besides bulking muscles may be to blame. Consult a physician to be sure the problem is not OTS, or overtraining syndrome, which can lead to osteoporosis, chronic fatigue, sleep and appetite disturbances and severe electrolyte imbalance. kidshealth.org: Why do I Gain Weight When I Exercise?